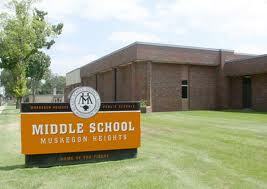 Led by Dr. Doris Rucks, Muskegon Heights Middle School Library to re-open. Lead by Dr. Doris Rucks, Muskegon Heights Middle School Library to re-open. The Muskegon Heights Middle School and the Coalition for Community Development invites the entire community to a Celebration of “My Library”. the event will be Tuesday, February 14, 2012, Valentine’s day, at the Middle School located at 55 Sherman Blvd in Muskegon Heights. in addition to an inspiring tour through “My Library” visitors will participate in a brief workshop. According to Dr. Doris Rucks, this will be the official re-opening of the Middle School Library.